Power Sound Editor Free is an all-in-one tool which enables audio enthusiasts to create, record and edit tracks within moments. It is not a very technical program, so it can be a welcome departure from more complicated software such as Audacity or WavePad. There is no charge associated with a download and no registration is required. 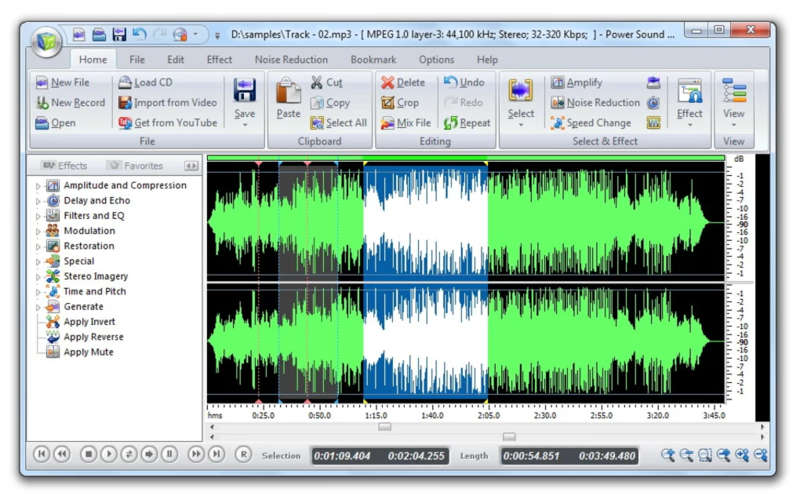 Power Sound Editor Free helps you record new audio file from a microphone, sound card or other input devices (you can record audio from DVD / VCD / CD Player, MP3 Player, RealPlayer, Windows Media Player, Web Page, Internet Conversation, Internet News, Internet Radio Station and more). This Free Sound Editor allows you to visually edit an audio file and apply different effects. Power Sound Editor Free is equipped with an impressive arsenal of editing and recording options. For instance, the user can record an audio snippet from nearly any third-party source (including branded software) and the editing options are offered with a visual functionality. Therefore, the entire package is associated with a rather ´hands-on´ feel. Audio CDs can be ripped and burned while all major audio codecs are currently supported. Online blog posts will keep users up to date with the latest improvements while pertinent advice is also offered on a regular basis. The editing options associated with Power Sound Editor Free are not to be taken lightly. Some actions include copying and pasting tracks, attaching two separate files together, adjusting a built-in equaliser, stretching an audio selection and producing effects such as echoes. There are more than 25 different effects which the user can choose from.